The Panthers in the Super Bowl has meant a noticeable increase in interest in the game in these parts. But even without that happening, we all know that most people are only at Super Bowl parties for the food. A recent poll in Bon Appetit even confirms it – only 30 percent of the respondents say they would actually be paying attention to the action on the field, not the state of the salsa-and-chip bowl. A wing has three joints. With a sharp knife or a good pair of kitchen shears, slice through each joint. Bending the joints and loosening them will help. You’ll end up with three pieces: the drumette, which looks like a miniature chicken leg; the flat, which has two small bones; and the flapper, the small pointy end. Collect the flappers in a reclosable plastic bag and freeze them to make chicken stock with later on. The remaining two pieces you may now prepare at will for eating. I like my wings fiery, but I accept that others are more tender of tongue. This recipe from my cookbook “Fan Fare: A Playbook of Great Recipes for Tailgating or Watching the Game at Home” has plenty of flavor even without the heat. You can easily double it to feed a larger crowd. Place the wings in a recloseable plastic bag. In a medium-sized bowl, combine the juices, soy sauce, ginger, garlic, sugar and oil. Stir well to dissolve the sugar. Pour the mixture over the wings in the bag. Seal and refrigerate for 8 hours. Preheat the oven to 350 degrees. Line a rimmed baking sheet with foil for easier cleanup and spray it with cooking spray. Remove the wings from the marinade and place on the sheet. Discard the marinade. Bake for 30 to 40 minutes or until they test done. OK now, ACC. I have tried my best to accept that you have added teams who can’t see the Atlantic Coast from their houses. And that the tournament will now last longer than a midseason replacement series. But this is too much. What in the world am I supposed to serve for a Saturday night final? All of my ACC Tournament recipes are for brunch. For years, I had a civilized gathering of like-minded sports fans, a time to sip of morning nectars and enjoy quiche and seven-layer salad before the battle began. Something that a dowager countess might not be embarrassed to attend, provided she was wearing the correct shade of light blue. Now what? I can’t possibly serve bloody marys after 5 p.m.
Blazing chicken wings, tubs of salsa, cold beers, these are the foods of nighttime game viewing. Less elegant, but welcome to the new ACC. However, I refuse to give up without a fight. This recipe from my cookbook “Fan Fare: A Playbook of Great Recipes for Tailgating or Watching the Game at Home” published by Harvard Common Press, will bring a touch of a Southern brunch to a munchie-central experience. Pat the okra pods dry. Trim the stems and tips from the pods. On a cutting board, spread 1 ham slice flat without tearing it. Gently spread a thin layer of cream cheese on the ham. Place 1 trimmed okra pod at one end of the slice and roll the ham up around it, pressing gently to make a tight roll. Trim any overhanging ham to fit the pod, the slice the roll into approximately 1/2-inch slices. Repeat with remaining okra pods. Keep chilled until ready to serve. Note: These can be made the night before and refrigerated. Store in airtight containers in a single layer or in multiple layers separated by waxed paper to prevent sticking. Some teams from somewhere are playing football someplace this Sunday. It doesn’t matter who or where – or how inflated their balls are – because Sunday actually is the Super Bowl of food. A rainbow of chips and dips festoons supermarket aisles in a glowing display unseen since Christmas. The price of wings usually spikes like gas on Memorial Day weekend, and for the same reason: supply and demand. If you do care about the game, you are aware that the quality of the food affects the outcome, right? In the course of writing my cookbook “Fan Fare: A Playbook of Great Recipes for Tailgating or Watching the Game at Home” (Harvard Common Press), I developed a couple of approaches to planning for the Super Bowl feed. First of all, prepare for a marathon, not a sprint. Fans will be there for many hours (I think the pregame hoopla started this morning). One approach is what I call Continuous Grazing. Think of your guests as ravenous animals prowling the African savannah. For this, put out a variety of finger foods and snacks. Chips and dips are OK, but you also need more hearty offerings. During the lengthy halftime, bring out some wings, baby quiches or roast beef sliders. Another way to organize the food is Big Bowls. Chili is always a hit, especially since it’s usually cold in early February and spicy chili offers that obligatory macho component to the day. Set up a slow-cooker or two with chili or soup, and let fans help themselves. Provide crackers or cornbread on the side; a salad if you feel vegetables are really necessary. Yes, you could resort to the prepared food cases at your megamart. But would your team take the easy way out? Do you want to take the risk that your inadequate party spread could doom your squad? Just asking…. 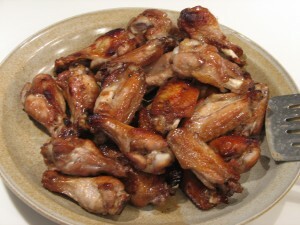 This recipe from “Fan Fare” makes wings with lots of flavor but no fiery heat. I picked the name because I also serve them during basketball season. Place the wings in a large zipper-top plastic bag. In a medium-size bowl, combine the pomegranate juice, orange juice, soy sauce, ginger, garlic, sugar and vegetable oil. Stir well to dissolve the sugar. Pour the marinade into the bag. Seal and shake gently to coat. Refrigerate for at least 8 hours or overnight. Line a rimmed baking sheet with aluminum foil or spray it with nonstick cooking spray. Drain the wings well (discard the marinade) and place them on the baking sheet. Bake for 30 to 40 minutes or until done. Serve warm. Note: These wings could also be grilled, but watch them carefully to avoid burning. From “Fan Fare: A Playbook of Great Recipes for Tailgating or Watching the Game at Home” by Debbie Moose, published by Harvard Common Press. When it comes to the American holiday that Super Bowl Sunday has become, the game itself is as necessary to the celebration as a Christmas tree is to Christmas:it might be nice, but isn’t really required. With all the food, parties and scoping for possible wardrobe malfunctions, who is wearing the uniforms on the field is almost secondary. Or perhaps that’s just the Panthers fan in me talking. People who don’t know a tight end from a tackle can still have a great time at the party, which is a little over two weeks away. And the food is vitally important. It must fuel fans for quite a period of time, since I think the pregame shows are starting in about five minutes. Whatever else you choose to serve, wings are the classic sporting event food. And making them yourself is better than ordering out, for so many reasons. You can save money and they’ll taste much better. You can tailor the heat level, or make wings that have lots of flavor without the fire. Save even more on your spread by purchasing whole wings and cutting them up yourself. It’s easy. Just use a sharp knife to cut at each of the three joints. Keep the drumette and the long piece (called the flat). The pointy part, called the flapper, throw those in a freezer bag and use them to make chicken soup. Wings can be grilled, baked, fried, even cooked in a slow-cooker, as I wrote in my book “Wings: More Than 50 High-Flying Recipes for America’s Favorite Snack” published by John Wiley & Sons. And they don’t have to be covered in hot sauce to have a lot of flavor. I enjoy hot food, but I prepare these for the Super Bowl spread to entice those of more tender palates. And for more of my Super Bowl tips and recipes, come to my class at Southern Season in Chapel Hill on Jan. 25. More info on that here. In a small bowl, stir together the hoisin sauce, orange juice, ginger, garlic, honey and cayenne, Set aside 3 tablespoons of the sauce. Place the wings in a large reclosable plastic zipper bag. Pour the remaining sauce in over the wings and coat them well. Refrigerate the wings in the marinade for 2 to 3 hours. Preheat the oven to 350 degrees. Cover a rimmed baking sheet with foil and spray the foil with nonstick cooking spray. Remove the wings from the marinade and discard the marinade. Place the wings on the baking sheet. Roast the wings for 25 minutes. Brush the wings with the reserved sauce and bake another 5 minutes or until the wings are done. Don’t like football? Who cares! It’s the NFL playoffs with the Super Bowl looming. And it’s all about the food at this point. My friend, author and food blogger Becca Gomez Farrell, recently moved from Durham to San Francisco. And since the 49ers are playing my state team, the Carolina Panthers, this Saturday, I asked her if she has heard of any interesting game-day food phenomenons. I personally don’t see a thing wrong with that, Becca. But for those who prefer a mellower guacamole, here’s an excellent basic recipe from my cookbook “Fan Fare: A Playbook of Great Recipes for Tailgating or Watching the Game at Home,” published by Harvard Common Press. Cut the avocados in half, remove the pits and scoop out the flesh into a medium-sze bowl. Mash coarsely. Stir in the tomato, serrano chile, green chilies, garlic, lime juice and cilantro. Taste, and add salt. Cover and refrigerate until ready to serve. Serve with tortilla chips. Note: You can make this a few hours ahead, but press plastic wrap directly onto the surface of the guacamole to prevent it from browning, then cover and refrigerate. Things didn’t go as my light blue heart had hoped on the basketball court Saturday night. But you can’t blame the food. Perhaps these sliders can redeem themselves on Super Bowl Sunday, Feb. 3. In a bowl, combine the turkey, jalapeno, bell pepper, onion, mustard, chili powder, garlic powder and cumin. Stir in the beaten egg. Stir in a good dash of olive oil. Combine the mayo, lime juice and cilantro in a small bowl. Add more or less lime juice to get the consistency your prefer. Heat about an inch of vegetable oil in a saute pan over medium heat. Form small patties of the mixture, about the size of a large soup spoon or what will fit the size of your rolls. Fry the patties on each side until brown and done through. Place cheese on top after turning the patties, if you want cheese. Drain the patties on paper towels and keep warm as you continue cooking. Cut the rolls lengthwise and spread a thin smear of the mayo on each side. Place the patties inside and top with avocado slices. Keep warm until serving. I know that coaches say not to look beyond the next game, but days before yesterday’s UNC- Maryland game I starting thinking about what I’d serve for the UNC-Duke game on Saturday. Real fans know that the food served during game viewing is as important as a good defense on the court. We have to do our part by serving verified lucky food. Mine is sausage balls. They work in many ways. They contain protein, useful for soaking up beverages. And they help one express one’s opinion of a bad call. And you can cook them ahead and freeze them, too. They’re pretty much the perfect food. I’m going a grazing route Saturday, rather than making main dish-y things that we’d have to sit down and eat. Besides the sausage balls, I’m thinking lemon-pepper wings, cheese, crudites and hot spinach-artichoke dip that will fulfill the need for a vegetable. We also consider Oreos lucky, so I’ll have them, too. Now, if The Hub remembers to wear the lucky socks, the Dookies need to watch out. Super Bowl spreads have your dips and cheese balls, but I know what you really want: Wings. According to the National Chicken Council, the weekend of the big game is the biggest time of the year for wings – it says 1.25 billion “wing portions” will be eaten. The chicken wing consists of the flat, the flat part with two small bones; and the drummette, the mini-leg part. The third part, the pointy wing end called the flapper, is typically removed – but if you’re cutting up your own wings, don’t throw that part away. Save them in the freezer to make chicken broth. I love a good hot wing, but I am aware that some do not share my love of flame. This recipe offers plenty of flavor without heat (although you could throw in a little Sriracha). It comes from my book “Fan Fare: A Playbook of Great Recipes for Tailgating or Watching the Game at Home” (Harvard Common Press, 2007). As you can tell from the title, they’re great for basketball games, too. Place the wings in a large zipper-top plastic bag. In a medium bowl, combine the pomegranate juice, orange juice, soy sauce, ginger, garlic, sugar and vegetable oil. Stir well to dissolve the sugar. Pour the marinade into the bag. Seal and shake gently to coat. Refrigerate for at least 8 hours or overnight. Preheat the oven to 350 degrees. Line a rimmed baking sheet with aluminum foil or spray it with nonstick cooking spray. Drain the wings well (discard the marinade) and place them on the baking sheet. Bake for 30 to 40 minutes or until done. Serve warm. Note: The wings could also be cooked on a grill. Drain them very well first. We’re deep into football season. Now is the time for all good tailgaters to come to the aid of their teams. To bring out the big guns. To bring out the fried chicken. Don’t even start with me about the stuff in boxes and buckets. That is not real fried chicken, and, frankly, offering it shows a lack of respect for your fellow fans and team. Don’t you want to feed folks better than soggy stuff encased in greasy cardboard? Making your own fried chicken is not difficult, and it will change your tailgating life. Homemade fried chicken is great hot or cold. Do what I do: Cook the chicken the night before the game and have it for dinner (make plenty, you’ll need it). Wrap the remainders and refrigerate for taking to the tailgate the next day. You can also select the pieces you prefer, whether it’s wings or thighs or breasts – no mystery chunks like you find with commercial fried chicken. Here is my technique for fried chicken, Southern style. I can’t guarantee a win if you cook it, but I can say that you’ll be happy at the tailgate. This is from my cookbook “Fan Fare: A Playbook of Great Recipes for Tailgating or Watching the Game at Home” published by Harvard Common Press. 1. Place the chicken parts in a large bowl and pour the buttermilk over them, making sure all the pieces are covered. Cover the bowl and refrigerate for at least 6 hours, or overnight. 2. When ready to cook, drain the chicken but do not rinse. Sprinkle the chicken lightly with salt and black pepper. Combine the cayenne pepper and paprika, if using, then sprinkle it on the chicken pieces. 3. Place the flour in a large plastic bag. Add 3 or 4 pieces of chicken at a time, toss to coat, then shake off as much excess flour as possible when removing pieces from the bag. 4. In an electric frying pan or a heavy frying pan on the stove, pour in enough oil to come to a depth of about 2 inches and heat over medium-high heat to 350 degrees. 5. Gently place the chicken pieces in the pan, in batches if necessary to avoid crowding the pieces. Cover and cook for about 5 minutes or until the undersides of the pieces just begin to brown. Then, uncover and cook for 4 to 5 minutes, until the undersides are completely brown. Turn the pieces over and repeat the process for the second side. (You can leave the pan uncovered for the entire process, using a splatter screen to keep down the mess. Do not cover for the entire cooking time or the crust will be soggy.) Adjust the heat as needed to keep the oil temperature at 325 degrees to 350 degrees. Be sure that no pink juices run when the chicken is pricked with a fork and that the internal temperature is 180 degrees when checked with an instant-read thermometer. 6. Place the chicken on wire racks set over plates or newspapers to drain. Cool completely before refrigerating.